With housing prices as high as they are, many of us are making do with what we can. 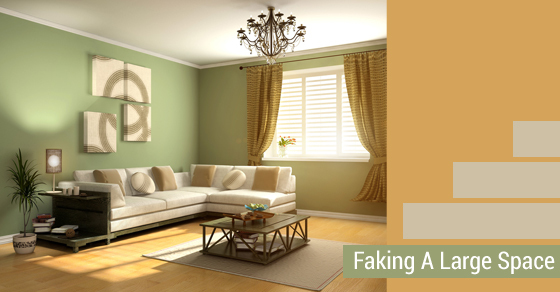 Luckily there are some tricks to making your room look and feel larger than it actually is. With some creativity, you’ll be able to pull them off to make your space look better than before. By adding a point of interest onto the ceiling of the room, it will draw the eye upwards so spectators are more likely to notice the upper half instead of the lower half of the room. It will also lengthen the space as perspective is emphasized in this way. By adding a light and airy pattern, it’s not only eye-grabbing, it’ll brighten up your mood. If you prefer a really nice touch, apply fancy wallpaper along the ceiling. However to complete this successfully, you’ll want to have a friend on hand to help. In a small space, you’ll see more of the walls in your periphery than you will in a large room, so the shade of your walls will have a strong impact on what you see. A mild shade of yellow wall paint will make everything seem sepia-toned for example, and all your pictures in that room will look very orange. When choosing a shade, make sure that there’s some blue in the base, even if you end up using a warm colour. If you have dark floors, you don’t have to put in a new carpet or flooring. Instead choose affordable, large rugs or mats that can be used to lighten up the space. This one tip is counterintuitive because it asks you to pull furniture away from the walls about an inch or two. The idea behind pushing furnishings up against the wall is to save the actual space remaining for walking around, resting, or using for whatever purpose. When you do so, it makes the room seem cramped, as if there was very little space available for the people in the room. Instead, allowing a gap plays a slight trick on the eyes, making the walls seem farther away. Tip: If you have furniture of different height, hide shorter furniture behind taller ones and place small items like lamps and trinkets on the short furniture so they appear to be floating, adding layers to what you see.